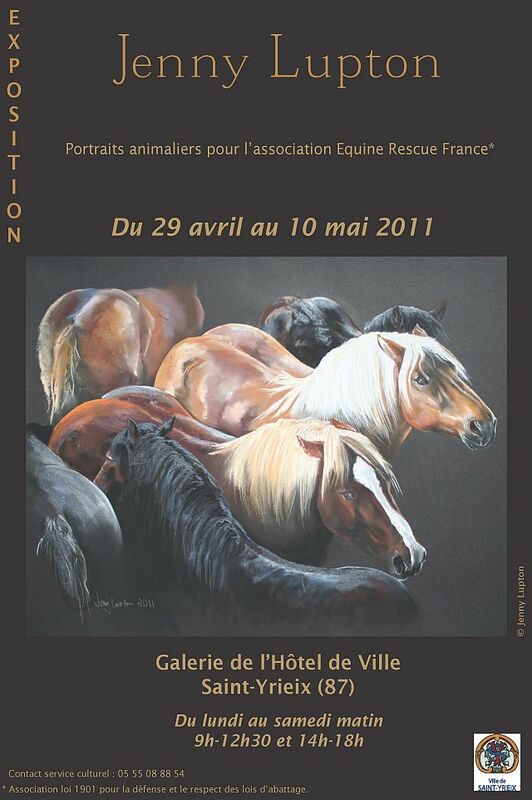 Renowned animal & equestrian artist (and ERF team member) Jenny Lupton is holding an exhibition of her works at Galerie de l’hotel de ville de St Yrieix, Haute Vienne. The exhibition will run from 29th April until 10th May where Jenny will be displaying her fabulous equestrian portraits including images of some of the equines that ERF have encountered at markets over the past few years. Some of her more famous subjects include portraits of event horses Call Again Cavalier, Mr Pracatan, Word Perfect, Two Thyme, King William and Delta, portraits of racehorses Beef or Salmon, Paris Pike and Pat’s Jester and the prolific point-to-point horse Balisteros. A compilation horse portrait featuring four legendary Scottish horses, Glenburnie, Lucius, Lisnamarrow and Flying Ace was commissioned by the I.L.P.H. from which prints were taken to raise funds for the ILPH. A commissioned portrait of the eight Hong Kong Derby winners from 1987 to 1994, auctioned at the ROA for charity to support RDA and KELY in Hong Kong, was bought by Ronald Arculli, gifted back to the RHKC, and now hangs in the hallowed ground of The Hong Kong Jockey Club at Sha Tin. Jenny has commissioned portraits hanging all around the world, and will accept commissions from all corners of the globe.